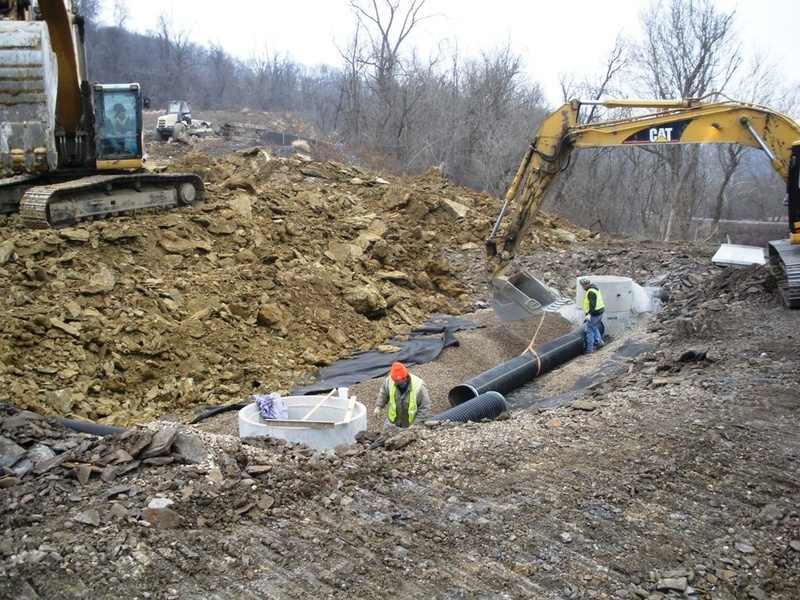 What is Stormwater Piping and How can it Affect a Construction Site? Most storm sewer piping and stormwater piping flows by gravity, no pumps create pressure. 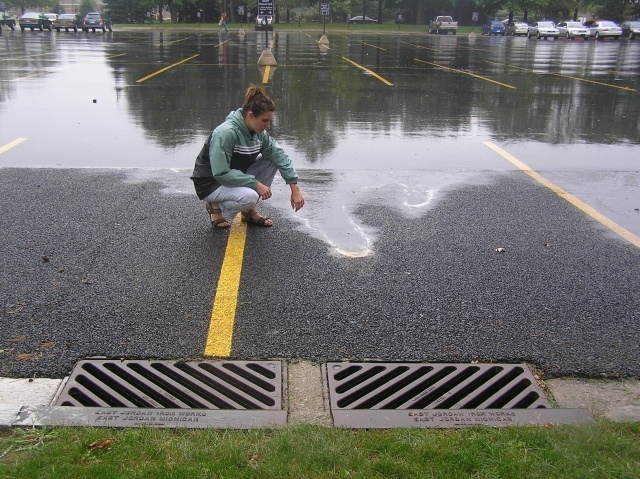 The storm water drops into the system by inlets or roof drains then flows downhill. Obviously, the grade of the pipe matters. A low spot, or belly, in the pipe makes a trap, while a high spot, or hump, creates a dam. So the pipe crew needs to keep the pipe inverts (the lowest spot in the pipe where the water flows) installed in a straight line, at the slope required on the site drawings. Unexpected rock or obstacle excavation. Existing pipes in the way, discovered only during the installation. Design errors that only become apparent during the installation. 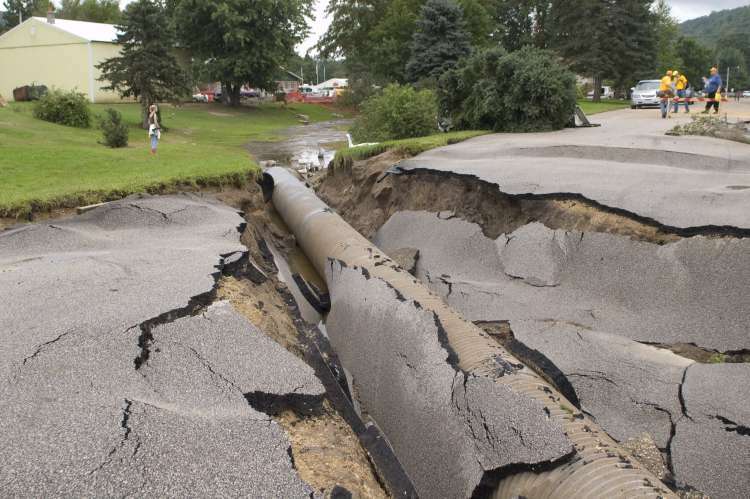 Because of these type problems, a company like Nationwide Consulting, LLC can head off problems that may arise in the site development process and pay special attention to the storm piping and other underground infrastructure. The goal for the pipe work should be a speedy installation that surpasses the specification requirements (i.e. leakage, line, grade, backfill, etc.). Even if the pipe work is subcontracted, it is detrimental to the project to allow unacceptable pipe work to continue. If the pipe work has to be dug-up and redone at a later date, many other trades will be adversely affected. Nationwide Consulting, LLC can inspect every item of work on the project if necessary. From our experience, one can predict the final quality (or acceptability) of pipe work by how the pipe foremen organizes the work. If the transit is set-up, the backhoe always digging, trenches are straight, and the pipe fitters are working methodically, the pipe work will typically be successful. On the other hand, a disorganized foreman and crew that appear to start and stop and constantly change methods are headed for trouble. At Nationwide Consulting, LLC we are aware of how the underground pipe works progresses and we try to head-off quality problems early. This type of qualified and experienced supervision can save days or in some case weeks of time and labor in the long run. It’s also important to have a basic understanding of the common pipe types. 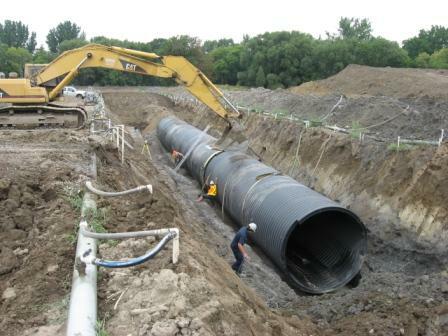 Most projects we see these days use High Density Polyethylene (HDPE) pipe. There are lots of variations of HDPE available, and we have worked with most of them. Sometimes concrete pipe still comes through as the best choice, due to its strength and durability. Corrugated metal pipe (CMP) may also be used in some site plans; we have worked with everything over the years at Nationwide Consulting, LLC. The degree to which storm sewer or stormwater pipe must be water-tight is normally made clear in the project specifications. Sometimes, a bit of water leakage from storm sewer piping is acceptable (often a trade off for lower cost and easier installation) and other times the storm sewer piping must be water-tight under a low pressure. 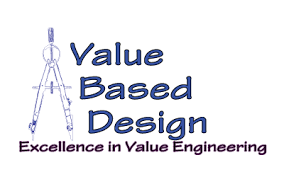 The most important thing to remember about your site and its stormwater piping, is to have an experienced professional firm handle it cost effectively. At Nationwide Consulting, LLC, we are proud to say, we are that firm, we handle all aspects of developing your full construction project from site to finished structure, to spec efficiently, cost effectively and on time. At Nationwide Consulting, LLC we understand the needs of the office complex developer, efficiency and cost effectiveness. One of the most important facilities of an office building is the parking facilities. Now we concentrate on commercial parking lot design and how to best serve both the developer and the eventual tenants and visitors of the facility, efficiently and cost effectively. The ease in which the customers can find a parking space near the office they are looking for is very important, in order to make that office complex a favorite destination. It is equally important that the visitors be able to find their way back to their car easily, and exit the office complex without incident. Once the office worker or visitor has safely gotten his or her car into the best available space, he or she has only to walk to the office destination. We have been assuming that parking would be laid out around the outside of the office building, with the interior of the Commercial Parking Lot Design reserved for pedestrian movement. Some parking lots have concrete sidewalks between the rows of parked cars. If they are installed, they should be at least 7 feet wide to allow for the overhang of the front ends of the cars, and to allow room for two people carrying files or equipment to pass each other without difficulty. An office building, which is served by a multi-story self-parking structure, is able to boast that no tenant or visitor need walk more than 110 feet from his parked car without being under some cover. 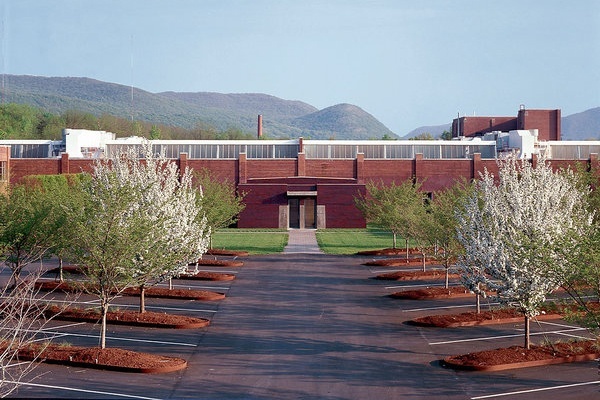 Covered walkways for office workers and visitors can be an important feature, especially where the parking is spread out considerably, and the weather often inclement. Multi-story parking garages, because of the relatively high cost per parking space, are not usually recommended by Commercial Parking Lot Design, except where the amount of land is limited and its cost per square foot is high. For office complex purposes, it is almost necessary that the structure be a self-service parking garage, and this fact raises some problems of design in a multi-level garage, particularly in the size of the spaces and aisles on each floor, and the width and design of the ramps leading to the floors and elevators. Can you have too much parking? We know of no existing office building that has too much parking. It is true some parking spaces are not economically used, due to their distant location from the offices. The poorly located spaces would be used more frequently if they were more conveniently located. The limit on parking area is for the most part determined by the distance that people have to walk to get from their cars to the offices. In an office complex which offers only an uncomfortable walk through a sea of parked cars, the limit that people can reasonably be expected to walk is about 350 feet. On the other hand, if you can offer the tenant or visitor something other than cars to look at, he will most likely walk further. Arcades with meaningful statuary and interesting displays, or pleasantly landscaped areas to walk through might permit the extension of the parking area in commercial parking lot design. 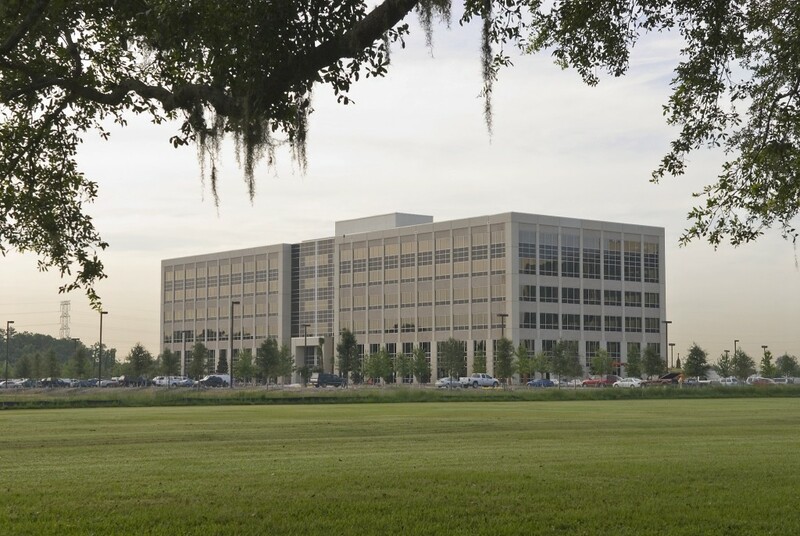 Nationwide Consulting, LLC has handled over 400 million dollars worth of office building and manufacturing facilities development projects all over the world. 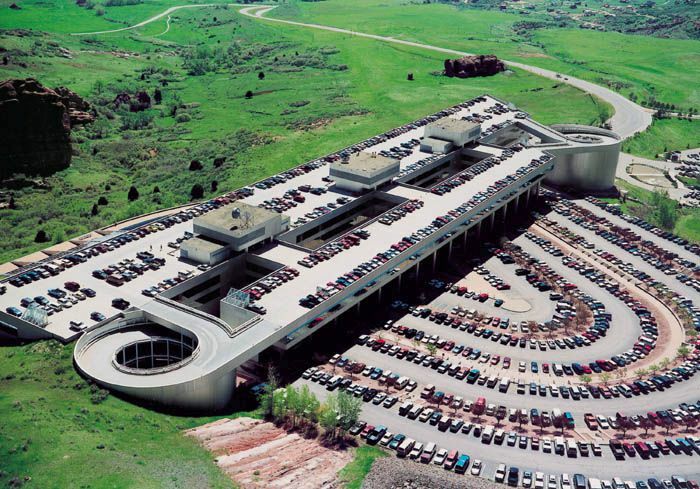 Unique challenges can come up in the office complex parking lot design process, and Nationwide is uniquely qualified to handle any challenge. Whether it is land clearance, demolition of existing structures, parking lot coverings, curbs, access roads, infrastructure, or the building itself, Nationwide Consulting, LLC is the go to firm for results. Put your projects site development supervision needs in our hands and be assured the job will be done, efficiently and in a cost effective manner. At Nationwide consulting, LLC we understand the needs of the office building developer, efficiency and cost effectiveness. One of the most important facilities of an office building is the parking facilities. This 4 part series concentrates on office complex parking lot design and how to best serve both the developer and the eventual tenants and visitors of the office building, efficiently and cost effectively. Parking space design and a great commercial parking area is the prime convenience advantage of the office complex over the central business district. In spite of the repetitive statement of this fact, the office worker and visitors to the office building may not always find the parking space he or she wants. The tenant and visitor alike want a space he can find easily, with a minimum of difficulty in moving around the parking area, and one that is located near the office door or the elevator which will get them to their office. The fault is sometimes with the developers who have underestimated the need for parking space or found the land too valuable to be devoted to parking. Sometimes there are too few parking spaces simply because there are too many people with cars looking for them. Walking from the space to the office. Leaving the complex, the office worker or visitor must go through approximately the same steps in reverse, including finding his or her car which occasionally seems more difficult than it was to find the space originally. Whether the office worker or visitor finds a space at all depends on the amount of parking space originally provided. The key factors in moving cars around the parking lot are the lay-out and width of the aisles between the rows of parked cars, especially near the most attractive points of entrance to the office building, the elevators and popular offices. 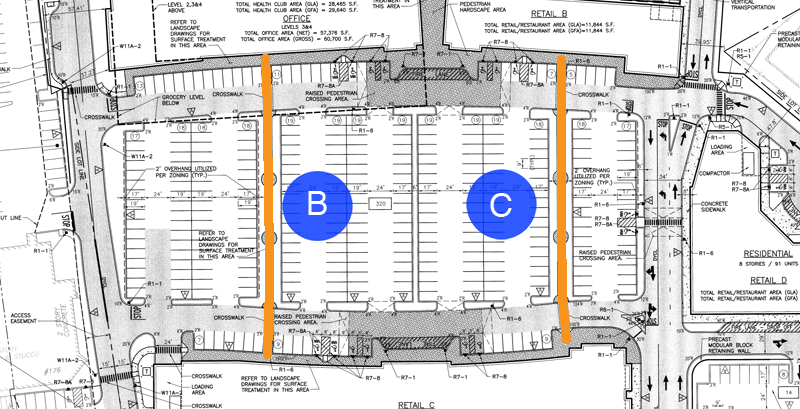 How wide the aisles should be depends mostly on whether the aisles will be one-way or two-way. If the visitors park their own cars, as happens at nearly all office buildings, then the aisles should not be so narrow as to make the task difficult, nor so narrow that one car being parked will temporarily tie up traffic in the aisle. 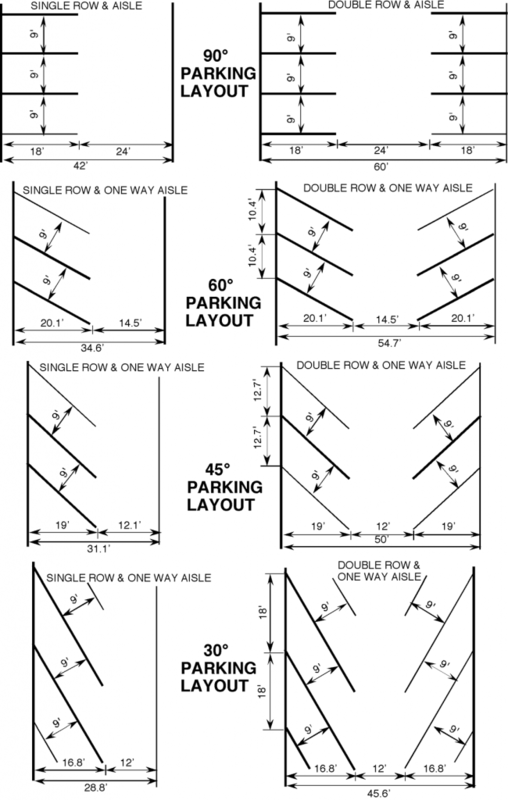 For one way aisles, width should be at least 10 feet; for two way aisles, about 20 feet. 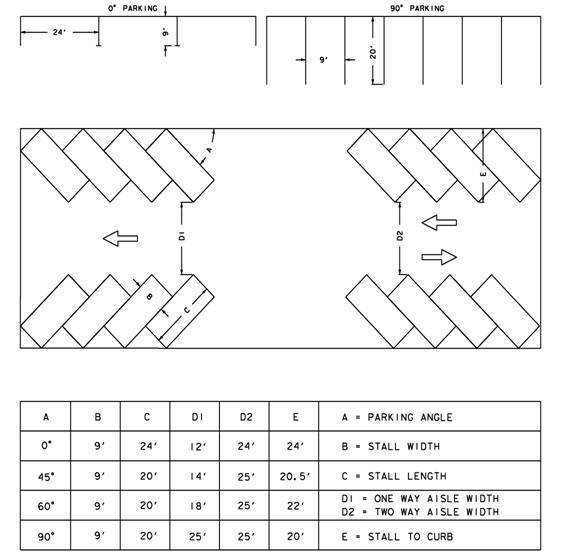 The total parking lot area per car space (including aisles) affects the office worker and visitors in terms of his or her difficulty or lack of difficulty in getting into a parking space. Not more than 200 square feet need be devoted to the space itself. Most regulations require a space 9 by 18 feet, and one 10 by 20 feet should be ample in any situation. The rest of the area (150 square feet per car) will be used up in aisles, exits and entrances, and landscaping. No land will be saved by making spaces less than 9 feet wide. Since cars are about 7 feet wide, a smaller space will encourage straddling the dividing lines, and the result will be even fewer usable spaces than if they were 9- or 10-feet wide. At Nationwide Consulting, LLC we understand the needs of the office building complex developer, efficiency and cost effectiveness. One of the most important facilities of a office complex is the parking facilities. This 4 part series concentrates on office building parking lot enterance and exit road design and how to best serve both the developer and the eventual tenants and visitors of the office complex, efficiently and cost effectively. Crowded highway intersections have long been considered good commercial locations, but the problem of entrance and exit road design to the office development is receiving much fuller consideration in modern office complex planning. The key to the access problem is not the volume of traffic passing the office building, but the density. As traffic surveys have often shown, the total number of cars passing a given point on a road (the volume) eventually drops as the density gets close to the saturation point. The reason for this relationship is simple. The closer the cars are packed together, the slower they must go. The roads having highest volumes are those on which the cars are spaced further apart and travel at higher speeds with relative safety. Both the high-density and high-volume roads offer problems of access to the office complex. 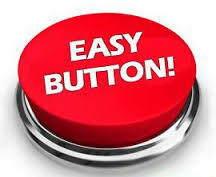 On the high-density, fairly slow-moving road, it will be difficult for drivers to maneuver into position to turn off. 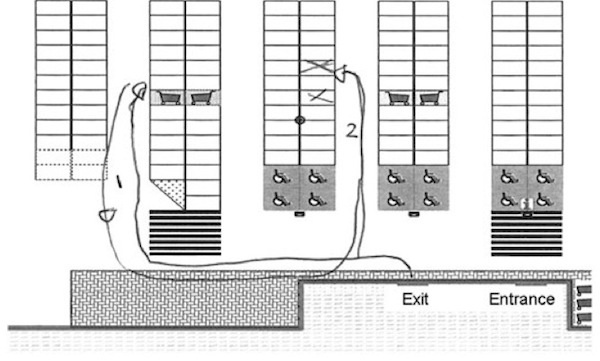 On high speed roads, ample warning must be given the driver that he is approaching an exit, and the exits into the office building must be designed with safety features that take the higher speeds into office complex parking area. 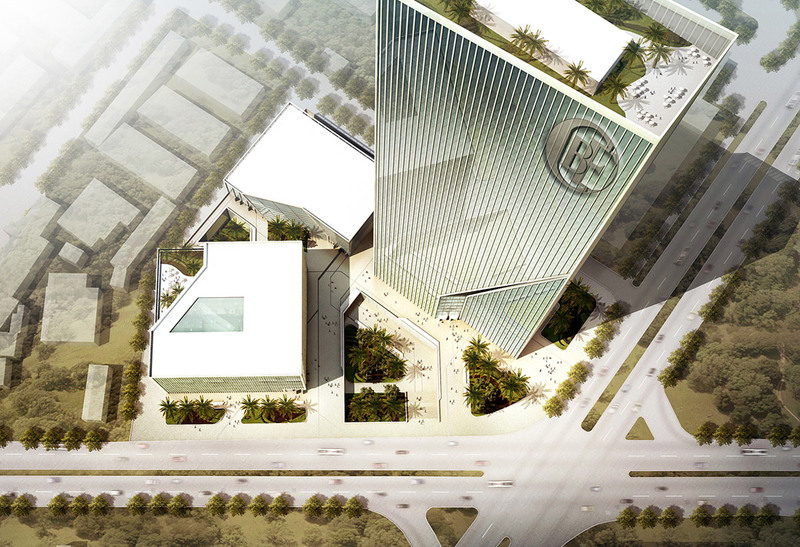 Few office buildings will be served by high-speed, limited-access roads. Office complexes being constructed in developing areas will be served by an existing road network which may not be adequate to handle the traffic that will arise when the office complex is completed and the area is built-up. The points of access from the roads to the office building should be adequate to accommodate traffic at the busiest hours of the complex, work start and work finish. The peak load of an office building can be estimated on the basis of the general work day start and work day end. The problem is three-fold: first, to determine the largest single-day gross use of complex; second, (on the basis of the average persons per car) to determine how many cars will be in and out of the office complex on that day; and third, to estimate the number of cars that will enter and leave the complex during the busiest hours of that day, and use this information for entrance and exit road design. At Nationwide Consulting LLC, we understand the needs of the office building developer, efficiency and cost effectiveness. One of the most important facilities of office buildings are the parking facilities. This 4 part series concentrates on Office building parking lot design and how to best serve both the developer and the eventual tenants and visitors of the office building and its facilities, efficiently and cost effectively. The road the tenants and visitors travel to get to the office building. The point at which the office workers and visitors leave this road and enters the shopping center. The search for unoccupied parking spaces for both tenets and visitors. The walk from the parking space to the office they are seeking. Office building developers must consider many facts which are not strictly within city planning jurisdiction, such as the trade potential of the area surrounding the office building, and the types of offices that should be located in a particular office building complex. As final plans for the office building begin to emerge, showing the size and layout of the building, parking area, and service areas, the needs of the tenants begin to be addressed. 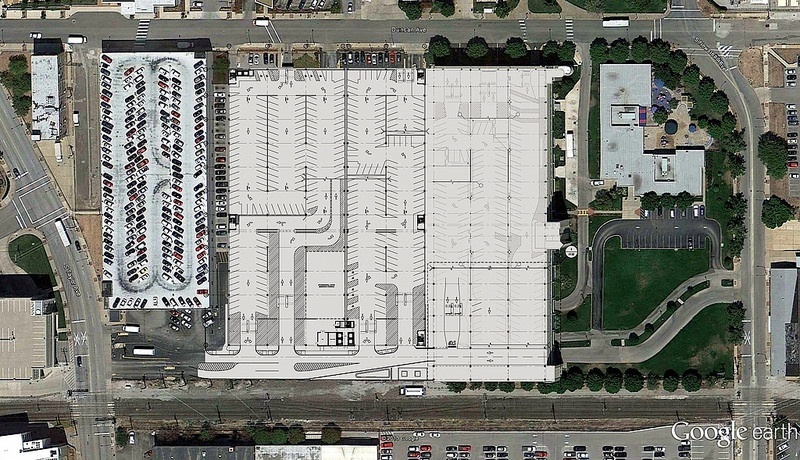 The planner should become vitally concerned with office building parking lot design, and the unique ways different problems can be addressed for different properties. Thirty minutes driving time is currently the accepted limit of the market area of a major regional office complex, which might serve up to 500,000 people. The area enclosed within the thirty-minute driving time has to be calculated according to the condition and congestion of the streets. 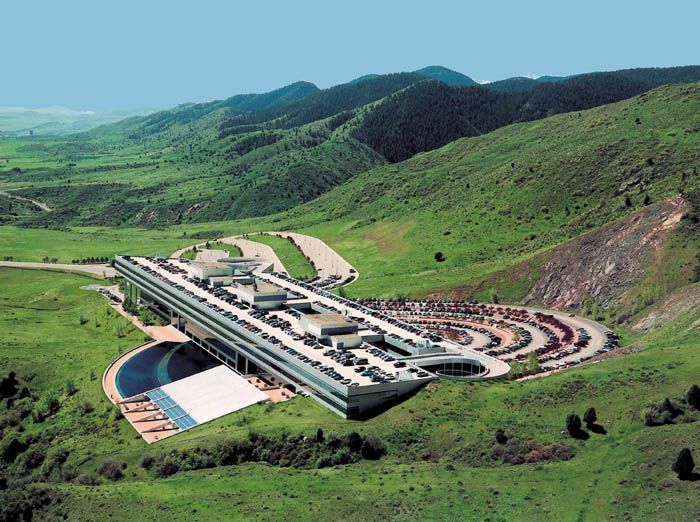 The Office building is not always in direct ratio to linear distance. Five miles of expressway may be traversed more quickly than five blocks of a crowded business section. 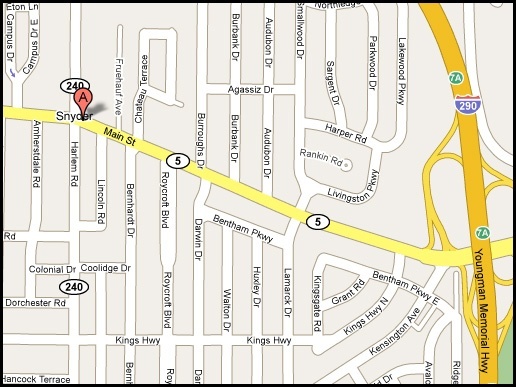 Office building developers recommend traffic counts of the major streets serving the complex. This is not so much an indication of the business potentiality, but as a check on the congestion already existing. It also serves as an aid in predicting the traffic situation after the complex is opened. As a matter of self-preservation, developers and architects recommend further studies, including the future road-construction programs in the area. It is also advisable to research future housing developments and population movements in the area, so that other effects on business and traffic may be determined. 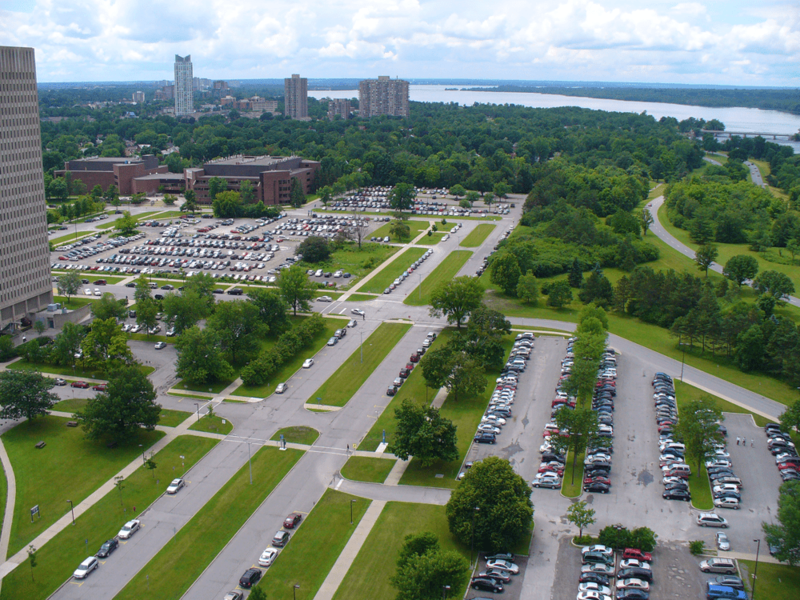 Once the gross annual volume of business of the office complex has been estimated, the average number of cars using the complex daily may be estimated. Also the peak traffic, in and out, may be estimated, and the time of day at which peak loads will occur may be determined. To the normal present and future traffic loads of the roads serving the office complex, must be added the traffic generated by the offices in the building itself. The totals must be compared with the capacity of the roads. If the roads do not have the extra capacity to handle the future traffic loads, new road construction should be in the offing, or the office building should be located elsewhere. If possible, the site selected for a new office building complex should be adequately serviced by existing public roads.